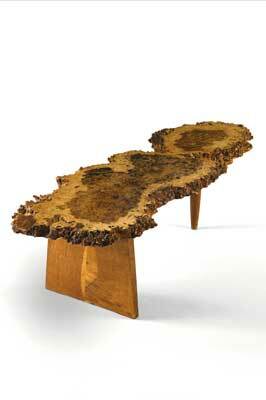 Some might think that George Nakashima's natural-edge tables are overexposed in magazines. Indeed, one of my students has just made his own copy. George's daughter Mira had her own name for this phenomenon - 'knock-off-ashimas'. But surely the number and frequency of the copies is a measure of the success of the design and the reason for the regular reproduction of photographs of his work is in order to promote the Master over and above the pupils. This table was in a sale held in New York in December 2013 and sold for Â£26,800. It is a splendid piece of English burr oak (Quercus spp.) and measured 1,090mm long x 330mm wide. Apart from the obvious visual appeal of the timber and the small size, what is distinctive about this piece is that it was made in 1968, which is early for a Nakashima piece. The story goes that George bought timber that other cabinetmakers wouldn't use because of the knots, waney edges, splits and holes. However to him, this was the real timber, unadulterated. His famous book, The Soul of a Tree, published in 1981, explains how he sees the woodworker's job as working with the 'spirit' of the timber not against it. Don't try and sterilise the wood by cutting out all its character. In 1968 this was a radical idea and it was only in the 1970s that his work began to become popular in the UK. The catalogue notes say: "Supported by a classic 'Conoid' base, this 'Slab' coffee table demonstrates a richly grained top with free edges, accentuated by the organic curves ofÂ dormant buds, which suggest a sense ofÂ vitality and movement in the piece. This example is rare for itsÂ smaller size and theÂ well-defined figuration of the wood's surface." George died in 1990 and the workshop, then being run by his daughter, almost ran out of orders. But they kept faith and struggled on, then in 1993 Mira was asked to design a memorial reading room. This produced a huge amount of publicity and the business took off again, but this time with Mira as the designer. They still make the classic, well-known designs, but also have new designs true to the original aesthetic. George described himself as a 'Hindu-Catholic-Shaker-Japanese-American'. He studied in America, France, Japan and India. With those cultural influences it is not surprising that he was more interested in the soul of a tree than the external shapes of fashionable furniture.